Nationwide guerilla hit-squads launching new Monster Hydro to the masses. 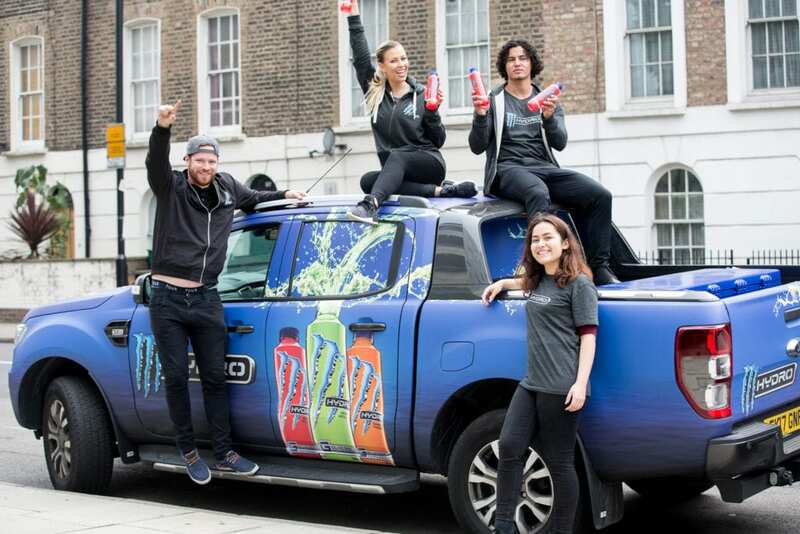 Together with Monster, Elevate helped launch Monster’s biggest sampling campaign to date, for their new non-carbonated energy drink – Monster Hydro. The 2-month experience, running six days a week, took place in key cities throughout the UK and Ireland. Elevate strategically built out the journey plan and chose events for based on their perfect fit for the Monster target market, including music festivals, race carting days & Premier League matches. A core team of consistent Event Managers and Team Leaders were recruited based on their mass sampling & roadshow experience. These core staff, along with a nationwide pool of brand-matched BAs with bags of Monster personality and energy, created a legacy of Monster trained staff across the UK. Elevate managed everything from nationwide logistics, chilled stock management and staffing, through to a live reporting dashboard and quality control program. Utilising Elevate’s expertise and broad database of site space information, we curated a campaign that was authentic to the Monster brand and ensured maximum exposure to their target demographic.